All the same, I’ve spent the last week playing obsessively, as if in a trance. This wasn’t the future I was expecting, nor is it the magical, futuristic game I may have imagined when I first played Fallout 12 years ago. But for all the things about Fallout 4 that disappoint me, there’s something undeniably captivating about it and the world it allows us to explore. I’ve already played 60 hours, and I will likely be fixated on Fallout 4 for hundreds of hours to come. In 2007, Bethesda, the publisher/studio best known for creating the Elder Scrolls fantasy RPG series, bought the rights to the Fallout franchise for $5.7 million. They then took the classic CRPG and modernized it, by which I mean they turned it into a first-person-shooter. 2008’s Fallout 3 was a huge transformation for the series, but despite the outward FPS appearance, many of the elements that defined Fallout were still present. Like Fallout games before it, Fallout 3 set players loose in a Mad Max type world full of mutated horrors created by the atomic fallout of a sudden world war. Like the original Fallout games, Fallout 3 presented a bracing blend of hard-boiled brutality and easygoing, arch humor. And like its predecessors, Fallout 3 gave players a huge amount of choice in how to approach the game. You could shoot or talk your way through Fallout 3, if you wanted. The hook of Fallout’s alternate timeline is the fact that American culture never evolved past the chipper, distinctly conservative optimism of the Eisenhower era. While American culture may have stagnated, technology did not. In Fallout, cold fusion is real—and it powers everything from weaponry to cars. The cultural and technological aspects of this alternate timeline present a retrofuturistic world where the atomic family is the center of the universe, and the split atom is the center of all human progress. Fallout 4 takes place 10 years after the events of Fallout 3. That’s not when it starts, however—in a neat twist, the game actually begins on the day the first bombs dropped on America. The player gets a brief chance to see first-hand what domestic American life was like before everything was destroyed, and that snapshot forms the lens through which your character views the events of the rest of the game. Immediately after creating your character and meeting your family, you learn that the world is about to end. Thankfully—and, yes, conveniently—your family was just given a spot in a survival vault near your home in the Boston suburbs. You rush inside of the vault right as the mushroom clouds start to bloom. Once inside, your character realizes that he or she has been tricked. As it turns out, your particular Vault—Vault 111—is an experimental facility where they’re cryogenically freezing all residents. With no time to complain or process what is happening, your character is turned into an unconscious ice cube. The game flash-forwards a century or two, at which point a dark turn of events leaves your spouse dead and your son missing. You are finally set free of your icy prison, 200 years after everything and everyone you know was wiped away. You have one goal: Find the people who killed your spouse and recover your kid. Everything about the intro feels rushed, which is disheartening, considering how curious Fallout fans are about the era before the bombs dropped. It’s all just an excuse, of course, a reason to let you loose on a version of Boston that you do not fully recognize or know. And that is the heart of Fallout 4: exploration. Adventure. Seeing new places, meeting new people, and learning how the world is making do with what’s left. Much of my time with this game has been spent pondering the secrets hidden just beyond the horizon. Wherever my gaze fell, I knew there was something new, waiting to be explored and conquered. Every landmark or ruin is an opportunity for discovery. It’s one of the most American aspects of an already very American series: Manifest destiny is alive and well in Fallout 4. The first few hours of Fallout 4 are an often bracing learning experience. 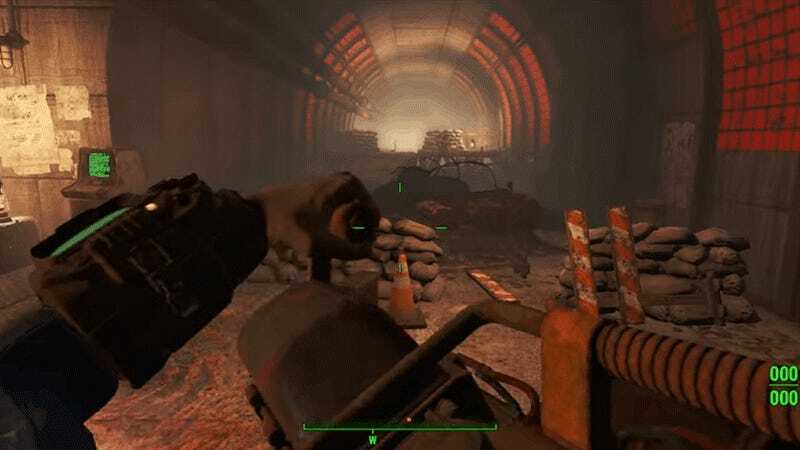 Most of the Boston wasteland—widely referred to simply as “The Commonwealth”—is hostile and harsh, and at first you’ll be short on the supplies and weapons you need to get by. Fallout 4 is a much harder game than New Vegas and Fallout 3 before it. Some will find this frustrating, especially at the start of the game, though of course, one can always lower the difficulty. I find the constant struggle of Fallout 4 appropriate and enjoyable, because it makes survival more meaningful. As you explore, you’ll constantly run into hostile enemies that you must kill or escape. How well you handle combat is at least partially dictated both by what you scrounge from the wasteland, as well as how you choose to specialize your character. Gone is the “skills” system from previous games, and in its stead stands a streamlined system with two major components: SPECIAL and Perks. SPECIAL stands for Strength, Perception, Endurance, Charisma, Intelligence, Agility, and Luck, and dictates your character’s fundamental makeup. Each Special ability has ten possible points, along with ten corresponding Perks that can be unlocked. You get a set number of points you can put into your SPECIAL build, and the more you put into a category, the more abilities you unlock in its respective SPECIAL tree. This, in turn, affects what your character can do overall. The more points you put into Charisma, for example, the more options you have to smooth-talk your way through Boston, be it through driving a better bargain while bartering or having the social acumen to command others to do exactly as you say. If a Charisma-focused character skimps out on Strength, that character won’t be able to use melee weapons very effectively, nor will they be able to carry much in their inventory. At first, you’ll have to carefully pick what you want to focus on, and those decisions determine how you’ll interact with the world of Fallout 4. Maybe you roll a roguish character, who uses sneaking and lockpicking to rob the wasteland blind. Maybe your character is a genius who uses robotics and hacking. Maybe you’re a bruiser who takes down foes with a huge pneumatic fist. The choice is yours. The system has been streamlined significantly from past games, which gave you numerical stats in a number of different areas as well as a huge number of perks for further customization. Initially, the streamlining felt front-loaded and restrictive to me, in that it asks players to figure out exactly what abilities they’ll have in the foreseeable future. The old system was more malleable, in that having your skills detached from your Perks meant that you could add points as you went along. However, in time, the new system eventually feels less restrictive—after 60 hours of playtime, I don’t really miss the extra layer of depth. It helps that Fallout 4 is generous with XP and there’s no level cap, meaning that whatever character you build can max out every single ability available to them. Provided you put in the time, of course. Your SPECIAL stats might dictate the range of your combat acumen, but it’s still up to you to pull the trigger. Fallout 3’s signature VATS system makes a return in Fallout 4, with an added wrinkle. By pressing the VATS button, time slows down and a new interface opens up, where you can target specific body parts on an enemy of your choosing. From there, you can plan batches of discrete actions, depending on how many Action Points you have (a number which is determined based on your SPECIAL spread). It’s a curious mechanic that acts as a throwback to Fallout’s origins as a turn-based game. Unlike Fallout 3, however, time does not completely halt while you’re in VATS mode. It’s a tweak that changes the flow of a given encounter, and forces players to make decisions more quickly. On the whole, Fallout 4’s combat is an improvement over Fallout 3. In Fallout 3, your real-time shooting seemed more directly affected by the stats you picked, with skills determining how likely it was that you’d hit something both inside and outside of VATS. In Fallout 4, when you aim at something and it’s in your crosshairs, the bullet will most likely travel exactly where you think it will. It’s a small tweak that streamlines yet another RPG aspect of the game, but it’s a welcome one. In Fallout 3, I used VATS as a crutch to compensate for how tedious and unwieldy the real-time shooting could be. In Fallout 4, I spend less time in VATS and more time shooting free-form. VATS is a bonus, a skin-saver for tight spots. While playing, I have to constantly decide whether or not I want to use my action points, and in the middle of a firefight, that’s a juicy mini-consideration. Do I use VATS and leave my success up to the cold, hard numbers and probabilities? Or do I trust my aim, tried and true? It’s an interesting decision-making process, and keeps combat engaging throughout. Another thing that helps keep Fallout 4’s combat interesting is the inclusion of legendary enemies. These fearsome foes, denoted by stars next to their names, are not only tougher than the normal fare, they can also mutate mid-battle and heal themselves completely. It’s a pretty annoying ability, to be honest, as dealing with these creatures often emptied me of my most precious ammo and healing reserves. Killing a legendary enemy rewards you with legendary gear, each of which gives you a unique ability. Right now, for example, I’m wearing two pieces of gear that slow down time when I hit 20% health. It’s awesome. The effect of the crafting system is most deeply felt with the return of Power Armor, the huge robotic exoskeletons that have become a symbol for Fallout as a whole. (To wit: Power Armor has been featured on the cover of every single main Fallout game to date.) In the past, Power Armor was aspirational, a thing you got near the end of the game, once you were strong enough. There was always a build-up to Power Armor. Fallout 4, on the other hand, gives you Power Armor right out of the gate. This might seem overindulgent, but Fallout 4’s relationship with Power Armor is different from past games. Not only can you customize every part of your Power Armor, it is now also fueled by a scarce energy source. As a result, your Power Armor feels like a vintage car. You only pull your Power Armor out on special occasions, when you need help on a particularly tough fight. The entire Fallout 4 crafting system is powered by...junk. Yes, junk. Bethesda games have always been full of interactive objects that you can pick up and look at, most of which serve as window dressing for creating more believable worlds. In past Fallout games, rubbish served mainly as a reminder that this world really has gone to hell. Folding junk into the game so that it’s actually useful makes sense on paper: in a world like Fallout, everyone would need to McGuyver scraps together to survive another day. In practice, sorting through so much garbage and constantly managing my inventory to deal with weight proves cumbersome, and it takes away from time I could be using to explore more of what Fallout has to offer. (It’s not helped by Fallout 4’s generally awful menus and user interface.) Junk management is one aspect of the game I wish Bethesda had spent more time trying to streamline. Despite my dislike for the inventory and crafting situation in Fallout 4, it’s something I learned to tolerate because of how useful the results are. There’s a fine, simple pleasure in destroying an enemy and knowing you did it with a weapon you assembled almost from scratch. Fallout’s mechanical underpinnings have been strengthened, but the changes I’ve described thus far feel less innovative and more iterative. Big picture: Fallout 4 looks and plays very similarly to Fallout 3, down to the identical lockpicking and hacking mini-games and the uncanny facial animations. Fallout 3 was an excellent game, but it was released almost a decade ago. Every time I turn off Fallout 4, I’ll sit there thinking to myself: “Shouldn’t there be more to this, somehow?” Maybe I’m being greedy. Maybe I’ve been conditioned to think this way by years and years of revolutionary, groundbreaking video games, and by the games industry’s laser-focus on exciting new ideas and inventions. But in the wake of games like The Witcher 3, which is leaps and bounds ahead of its last-gen predecessor, it’s hard not to look at Fallout 4 with a touch of disappointment. This is it? Really? All the same, Fallout 4 is very good at keeping me hooked. It accomplishes this by constantly dangling the carrot of better loot while giving players a map that is full to bursting with new things to discover. Fallout 4 has also adopted another one of Skyrim’s defining features: the Radiant Quest system, which provides players with a never-ending—if eventually somewhat shallow—supply of randomly generated missions that can be repeated indefinitely. Fallout did not become a classic by providing its players with an endless supply of randomly generated monsters to kill and stuff to collect. I like having that stuff as an option, but when I think Fallout, I think about the stories, the characters, and the world itself. I think about the many choices Fallout presents to you, no matter how absurd or game-breaking they might be. That writing and flexibility is what brought the first Fallout to life, and what motivated players to go exploring at all. It’s why Fallout 3 could get away with having such wonky combat in the first place. Lots of players didn’t care how that part of the game played, not really. It was a means to an end. Fallout 4 has so far had a tough time matching those sorts of moments. At least part of the blame for that rests at the feet of the new dialogue system. Instead of seeing what your character is going to say in full, Fallout 4 adopts a Mass Effect-like system. You get a maximum of four dialogue options, all denoted through a few on-screen words that do not always give you a good sense of what will be said next. Fans have provided mods to fix that issue, but even if Bethesda patched this feature in, it couldn’t fix the fact that on the whole, Fallout 4’s writing is thin. You never have particularly long or nuanced conversations with the other characters. I like to play a Charisma-focused character, and I was disappointed. Fallout 4’s conversations often feel rushed, like your character is in a hurry to stop talking and go shoot some more stuff. The fact you can walk away from people in the middle of a conversation tells you everything you need to know about Fallout 4’s dialogue. And it certainly doesn’t help that so many of the choices given to the the player are false—whichever options I chose, I often found myself railroaded to the same short-term conclusion. There are some upsides to the new dialogue system: Conversations can happen around you while you’re exploring a town or a settlement, regardless of whether or not you opt into them. You’re free to draw yourself closer to the NPCs and hear what they’re chatting about, or to ignore them and to be on your way. Often, if you’re willing to stop and listen, you can learn about a new location or gain a new quest. It’s an elegant way of disseminating information to the player, and in the right circumstances, can make towns feel more alive. Situations like that just feel more rare, now. It saddens me to say so, but more often than not, I’ve found myself mentally checking out of conversations in Fallout 4. While Fallout 4’s “find your son” premise is kind of hokey, many of the main quest missions are quite good. Quests feel experimental, more frequently on par with standouts like Fallout 3’s Tranquility Lane. For example, there’s a quest in place called the Glowing Sea, and it takes you well off the main map into an hellscape that’s so irradiated, nobody dares tread there. Walking through the Glowing Sea in my Power Armor was something else. I loved feeling that desolation, I loved feeling the terror that came with discovering what horrendous monsters might live in a place like this. I’d love to tell you the specifics of other main quests, but I don’t want to spoil them for you. Let’s just say that Fallout 4 goes to some pretty interesting places. As you go along, you find out that one of the Boston commonwealth’s main conflicts surrounds “Synths,” human androids built by a mysterious entity known as The Institute. The Institute is the Commonwealth’s boogeyman, a scary collective that can be blamed for anything and everything that goes wrong. Fueling that paranoia is the fact that advanced synths are essentially indistinguishable from humans. If you’ve watched Battlestar Galactica or seen Blade Runner, then you already have a sense of where this is all going. There’s paranoia. Philosophical explorations of what it means to be human. People who support androids, and others who are threatened by the existence of androids. Androids who are human enough to make you question your prejudices. It’s an interesting—if clichéd—premise that works well enough, but thanks to the stripped down dialogue system, I never felt particularly invested in any of the factions or alliances presented to me. While each of the groups vying for control over the Commonwealth are interesting in theory, in the game they often came across as ideological zealots who leave little room for nuance and complexity. Fallout 4 truly shines in its sidequests, and happily, these quests are numerous and varied. By putting the larger narrative aside, the writers at Bethesda embrace the freedom to tell one-off stories that aren’t beholden to the larger politics of the Commonwealth. Boy, do I love Fallout 4’s sidequests. There’s the one where you go into an Irish Tavern in search of a robotic drinking buddy. Or the one where you turn into a comic book superhero, costume and all. There’s the one where you explore the art gallery of a psychotic serial killer. And there’s a horrific quest during which you explore the remains of the Salem Witchcraft museum. The list goes on and on; Fallout 4 has no shortage of hilarious and intriguing sidequests that, when taken together, tell me much more about this absurd world than the more focused main story could hope to. Along the way, you’ll meet follower characters who can join you on your journey, each one with a distinct background and moral compass. These characters are all well written and fleshed out, sometimes to an amazing degree. One follower is an intrepid wasteland reporter, for example, and if you take her with you on your travels, she’ll stop people in the street and interview them. Another follower is actually a synth, and if you take him with you and spend too long standing around, he’ll take out a screwdriver and begin performing repairs on his own body. Diamond City, a large community built within the wreckage of Fenway Park, is beautiful and surprisingly functional for a video game town. It looks like an actual city, where people live and work. You can tell exactly where the town gets its water, its food supply. There’s a place where kids get an education. You know exactly where people go to unwind and have a good time. Shops and houses, though crammed together in a small space, make the most of what they can in a way that might be familiar to residents of New York or Japan. It’s all helped along by some stellar art direction. Fallout 4 may not have the graphical fidelity of its contemporaries, and it can look rough—especially if you pay close attention to the finer details. Even so, some strong art direction (and a nice original score composed by Inon Zur) presents a world that is brimming with atmosphere. It is always a delight to walk through new areas and and take it all in, even if the residents of the Commonwealth can be a little grouchy. This is the east coast, though, so I guess a little grouchiness is to be expected. I’ve written so many words about Fallout 4, but I have yet to touch on its most obvious addition: the new settlements system. In addition to customizing your weapons and armor, you can also customize and manage a network of settlements spread around the Commonwealth. You can build structures, craft defenses, recruit new settlers, grow crops, and generally go full Minecraft. At first, the level of freedom you’re given is almost jarring: If you don’t like a wall, you can tear it down. If you think your settlement needs an armory, you can build it. If you want to have a palace full of teddy bears, you can make that happen. If you want to start your own store, you can totally do that. All provided, of course, that you have collected the right materials. A little more than a week after the game came out, I’ve already seen people create all sorts of ridiculous and amazing things, including a Cat Cafe, a dance hall, and even a torture chamber. I have no doubt that players will go on to create even more wild things as time goes on. Unfortunately, the game barely explains how any of the settlement mechanics work, and the entire system is buried beneath a truly atrocious user interface. The settlement interface is so unwieldy and poorly explained that whatever neat contraptions fans have built have essentially been achieved in spite of it. Personally, I just don’t really have the patience to deal with it all. I don’t want to fight the game in order to make something cool, especially not after I’ve played better-designed and more user-friendly recent games like Animal Crossing: Happy Home Designer and Mario Maker. I’m sure some industrious players will feel differently, but when it comes to making my own in-game stuff, I’m just not that interested in what Fallout 4 is selling. And yet… and this may be a common theme with this game: I’ve gotten pretty sucked into managing some aspects of my settlements nonetheless. Your settlements are filled with people, and those people get more or less happy depending on how good a job you’re doing providing what they need. It feels a bit like playing The Sims, except with Fallout. Or perhaps it’s more appropriate to compare settlements to Fallout Shelter, the mobile game released earlier this year where players could build and manage their own vaults. Part of me wishes Bethesda hadn’t put so much emphasis into settlements and crafting. As much fun as I’ve had with some of its various aspects, none of it is really why I play Fallout. Then again, part of me senses that some more traditional aspects of the Fallout formula are starting to fray from overuse. I’ve played a lot of Fallout in the last 12 years. I’ve dealt with countless stories of Super Mutants, Ghouls, and human survivors, with all the twists and turns those stories could have. Perhaps, in order to combat the growing overfamiliarity with Fallout, Bethesda has started giving us the tools to make our own Fallout, instead. Perhaps it’s fitting that I’ve thought of Fallout 4 in these terms, too. I’ve bought into the new generation’s promises of a magical tech future, and came in to Fallout 4 with my own set of expectations based in part on other, more polished big-budget games. But Fallout’s appeal has always transcended that. The fact that so many people are willing to tolerate Bethesda’s so-called “jank,” that so many people love games like Fallout and Skyrim in spite of and even sometimes because of that jank, is a testament to these games’ deeper appeal. The American dream is alive and well in Fallout 4. In this game, you really can pull yourself up by your bootstraps and thrive. In this way, Fallout 4 continues Bethesda’s vision of an oddly hopeful post-apocalypse. Rebuilding is possible. First, we’ll purify the waters. Then, we’ll reconstruct the towns. Then, we’ll make a really cool rocket launcher. This may not be the future we were promised—and some of us might get replaced by robots during this adventure—but we’ll still find a way to return America to its former glory. Just you wait and see.